You've probably heard of vampire power before. Maybe you don't know exactly what it is, or what it means for you. Vampire power is the energy that runs through items that are plugged in, but not actually doing anything. Your TV that's turned off, your DVR box, your phone charger in the socket but not plugged into your phone - they are all drawing energy, and costing you money. According to Energy Star, the average US household can spend about $100 a year from electronics in standby mode. 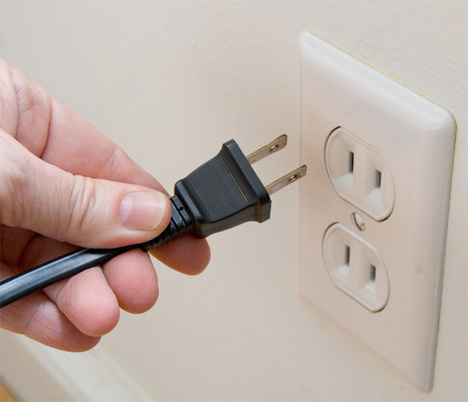 If you don't think you could be spending that much, take a look around your house and review what's plugged in. Here's a handy tip: Anything with a screen, or a digital display, draws vampire power. Your clock, microwave, DVD players, etc. PCWorld has a great list of common household items that draw vampire power. Now, some things need to be kept plugged in and drawing power, and that's fine. Although I don't have shmancy cable, I know how you people like to record your shows, and that's a little impossible if the box is unplugged. But, you can have your TV unplugged and still get your shows recorded. I also need the clock on my microwave to always be correct, mostly so it can tell me how late I'm running in the morning. But for any nonessential electronics, get a surge protector and flip the switch any time you don't need what's plugged in, and cut the vampire power from seeping through the cables. And by all means, unplug phone, iPod and camera chargers when the devices are fully charged or disconnected. They're a smaller source of vampire power, but it still adds up. When chargers are only plugged in while in use, the energy used is more efficient and streamlined. Reducing extra energy is an easy way to conserve and save money throughout the year. Unplug!